I am lucky enough to be joining the Sundae Girls next weekend!! In the meantime, for a chance to win a gift voucher to spend at Simon Says Stamp, you'll need to play along with this weeks challenge, Birthday Special. Pop over to Paper Sundaes to get all the details and see the wonderful creations the Sundae Girls have made. lovely card #Faye...sometimes less is more as they say!! congrats on your new post..woo hoo can't wait to get working with you..again..lol!! Congratulation Faye! 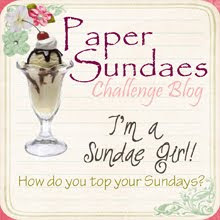 You will love it at Paper Sundaes! Congratulations Sweetie ! They are lucky to have you ! I love your card : less is more they say and it's true ! Hugs and love from La Chic ! Yay! Congrats on becoming a Sundae girl! You are going to have so much fun! Hmmm, sundaes, cupcakes - you have a bit of theme happening here girl! Congrats! That is always exciting. It seems we all get in a bit of a mojo slump, but it always seems to pass too! You'll get it back! You cards are always great! I love the CAS look of this one! The paper is great with the sentiment & flower! Beautiful things come in simple packages. LOVE it! Hi Faye, Well done on your new DT! Love your card ... wish I could make good CAS cards. For some reason mine always look unfinished lol! congrats on joining the Sundae-girls ! And this card is lovely. Clean, simple, and beautiful! Congrats on your new DT....I love this card,gorgeous green and I love the gingham...Hope your well??.. See you in the morning then! So why did I also not know about Sundae?!!!!!! Muver. Thats what I do, often I upload cards, and just save them for when I havent had time :) Good idea. Have a great week, your mojo isnt far away ;) I always say, just look back over your blog, see your gorgeous creations and pick something you enjoyed doing and then have another go at it! tidying up often works for me too, the minute my craft room looks tidy, I want to play and mess it up again! lol. What a fab card!! And CONGRATS hun for the new DT spot!!! *claps* congratulations! you are in demand and I can see why, you make the most delish cards. 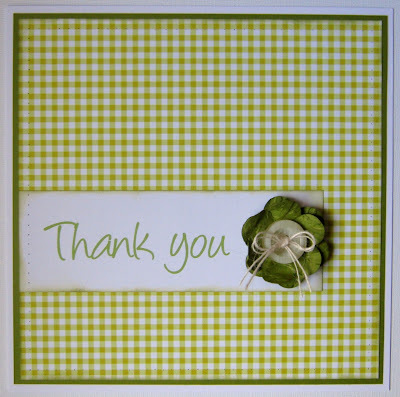 I love this simple but very elegant DAZ card, and in your fave colour too eh?